End unit townhome close to the pool on Anna Maria Island. 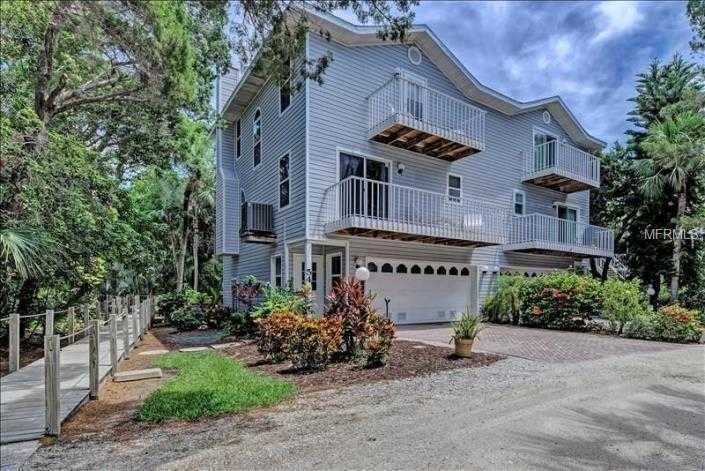 One and a half blocks to the beach, this gorgeous 3 bedroom 2 1/2 Bath townhouse is nestled in the trees with 3 porches (10×20 screened porch with view of the pool, open porches off dining room and master bedroom). All 3 bedrooms are upstairs. This home is right next to the walkway to the pool with a pool view. No carpet. All floors are redone with wood & tile. Popcorn ceilings removed & lighting has been replaced. Kitchen has new appliances. You’ll enjoy the rare cool evening with a wood-burning fireplace in the living room. Conveniences included a laundry chute in the Master bedroom. Roof, A/C, fireplace were replaced 2009-2012. There’s plenty of room for parking with the 2 car garage. The large bonus room behind it is perfect to store all your beach toys. There’s a wood deck with outdoor shower off the bonus room too. North Beach Village is a great community. Don’t miss this one! No size restriction on pets and weekly rentals are allowed. Restrictions: No size restrictions on pets. Must have pets on leash and pick up after (this is Holmes Beach ordinance also). Cannot have kennel. Please, send me more information on this property: MLS# A4432745 – $525,000 – 6250 Holmes Blvd #54, Holmes Beach, FL 34217. I would like to schedule a showing appointment for this property: MLS# A4432745 – $525,000 – 6250 Holmes Blvd #54, Holmes Beach, FL 34217.